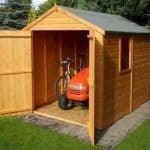 The 10 x 8 Shed-Plus Heavy Duty Combination Double Door Wooden Shed is one of the most high end 10 X 8 wooden sheds on the market right now. Actually it is more than that. You see, this is a shed that is two in one. The front and larger section of the shed serves as a large workshop, complete with two opening windows and a large single door. Then at the back we have an extra section that is for storage. 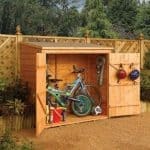 This extra section is a very good size for general storage and it even has its own door, keeping it separate from the main portion of the shed. This shed is a very rare case where every single aspect of it is high quality. The cladding is 12 mm thick tongue and groove shiplap cladding that is smooth and very strong. Both the roof and the floor are made with tongue and groove boarding which makes them strong, but also fit in with the style of the rest of the shed. Even the doors and the windows are made with the finest materials. In all this is just a very well made shed that has a great look and will last for many years. 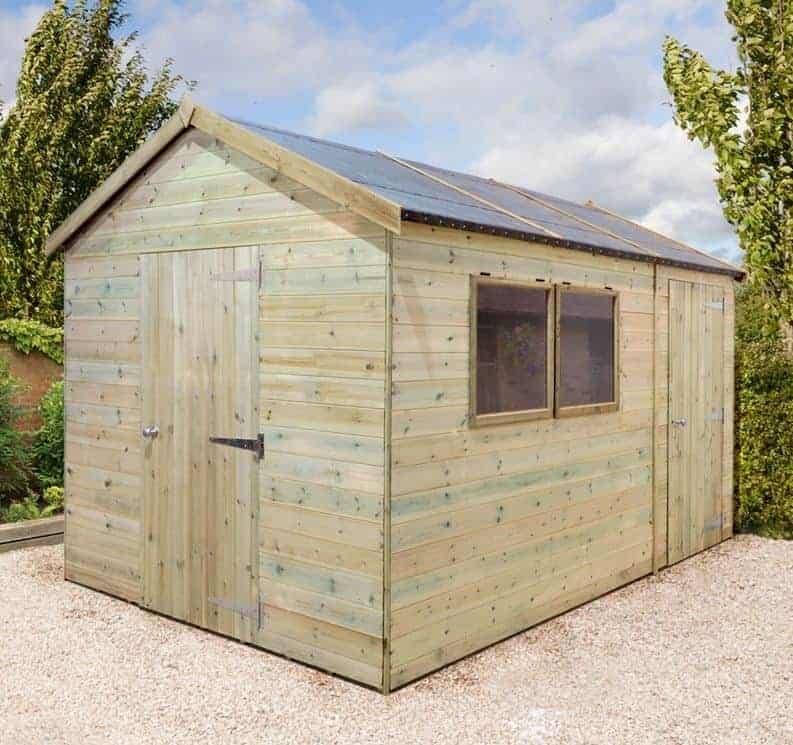 The 10 x 8 Shed-Plus Heavy Duty Combination Double Door Wooden Shed really is one of the most impressive wooden sheds we have seen in quite some time. We hope that people actually read this review before they look at the price tag. 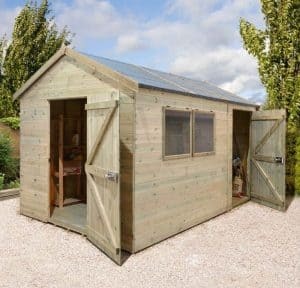 While this is one of the more expensive 10 X 8 wooden sheds it is also one of the very best. 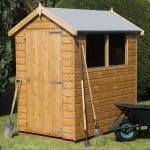 Made with premium European softwood, this is one very classy looking shed that just oozes high quality. What we love about this shed is that really it is two in one. You see you have the main part of the shed which is 6 feet wide and 8 feet deep, but you also have a smaller area at the back of the shed which is 4 X 8. This means that you can use the area at the back for general storage and the main, larger area at the front as a workshop. This is a fantastic set up and one we are surprised more sheds have not used. 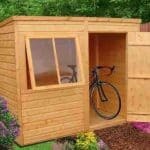 If you want storage space and an area to work then this shed is just ideal for you. The roof is just as high quality as the rest of the shed. It is an apex roof and it is made with 12 mm thick tongue and groove boards. This first of all is very strong, so no matter how hard the rain hits or how much snow sits on top, this roof is going to be able to take it. Also on the inside of the shed these boards look very nice and go perfectly with the cladding. The roof also has a slight overhang all around, which is something we really like. 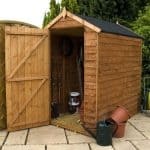 The 10 x 8 Shed-Plus Heavy Duty Combination Double Door Wooden Shed has some very nice cladding. They have used 12 mm thick tongue and groove shiplap cladding and thanks to that European softwood it has a very stand out look. We love how natural this looks and the cladding also has a very smooth style to it. The cladding as well as looking good is made so well that there is no way for rain to get inside. When you consider just how big a shed this is, you need a good frame to ensure that it is solid and will stay strong for many years. Well they have put a very impressive frame inside of here. The frame is 24 mm x 34 mm which is actually a little thicker than the standard. This means that the shed will have a very robust feel to it and it will stand strong for a very long time. So we come to the floor. We must admit that we keep expecting to find out that they have cut corners somewhere, but that is not the case at all. The floor is made with just as much care and quality as the rest of the shed. It is made with those same 12 mm thick tongue and groove boards as the roof. Supported with high quality floor bearers, these boards are able to take a lot of weight, so if you want to use this as a workshop with some really heavy tools and workstations it will be able to handle that kind of weight. The 10 x 8 Shed-Plus Heavy Duty Combination Double Door Wooden Shed is actually pressure treated so there is no need for treatment. The pressure treatment process that the wood has gone through actually means that you never need to treat this shed. Which we are sure is something you are all very happy to hear. The doors are one of the first things that catch your eyes about this shed. The reason for that is that there is two of them. They are both made in the same style. Each door is fully ledged and braced so they are strong and will never become weak as the years go by. Each door is 5 feet 11 inches high and 2 feet 11 inches wide, which is a very good size for single doors. One side of the shed has two large windows. These windows can actually open and they are both made with toughened glass. The windows are in a prime location, especially if you plan on using this as a workshop as they will let in plenty of fresh air. In keeping with the high end theme that the rest of the 10 x 8 Shed-Plus Heavy Duty Combination Double Door Wooden Shed has, the security is fine, actually it is more than fine. You see each of the doors has their very own rim lock that comes with a key. This means that there is no messing around with pad bolts and padlocks. It will also mean that you feel more comfortable putting more expensive things inside the shed. The privacy that this sheds is actually quite interesting. You see on the workshop portion there of course are those two windows so you can see inside. But the actual storage section at the back of the shed does not have any windows so anything you place inside here is kept hidden away. 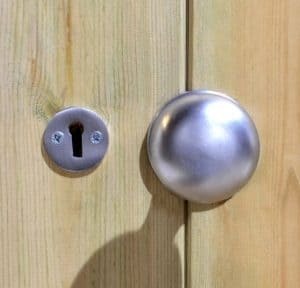 We feel that the design of the shed as far as privacy goes is just fantastic and very well thought out by the designers. They are not offering any customisation options with the 10 x 8 Shed-Plus Heavy Duty Combination Double Door Wooden Shed and we are fine with that. This is a premium, top of the line 10 X 8 shed, so the last thing you should be doing is messing with the design. There are a couple of extras with this shed. The first one they have is their professional installation service. 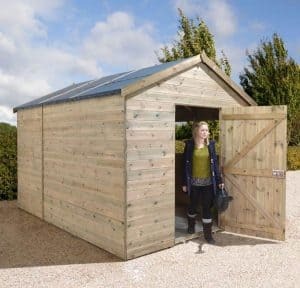 This does cost £96.85, but that is actually a very reasonable price and as this is such a high end shed, you might want to consider having a professional install it for you. If you want to go all out then you can add a very smart looking slated roof to the shed. While this looks very cool it does also add an extra £309.99 to the overall price. We honestly could not have put this any lower than a 10. We really cannot think of a single thing that they could have done better with this shed. As this is made from high quality pressure treated European softwood, the shed is going to last a very long time. Also it will not require much, if any, upkeep from you. We love how they have two separate sections in this shed. One for work and one for storage - it means that you have a lot of room at your disposal here. 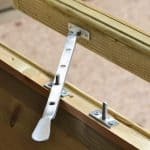 We feel that their installation service is very fairly priced, but if you are installing this on your own it can be a bit tricky. We say this because it is so large. If you are installing this yourself, make sure you have someone there to help you. 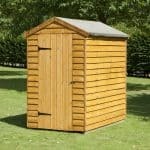 This is one rather highly priced 10 X 8 shed, but this is still good value for money as it is so high quality. However, we do know this price tag does put it out of reach for some people. Final Thoughts: We must admit that we really cannot think of anything bad to say about the 10 x 8 Shed-Plus Heavy Duty Combination Double Door Wooden Shed. They have made this shed just so well. From the floor to the roof, this is high quality all the way. Of course the price is high, but in all honesty they could not offer this shed for anything less than they are. 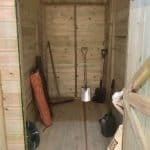 This is the kind of shed that is perfect for those of you who want the very best; those of you who want to buy a shed and get a lifetime of use out of it. This really is high class and high quality all the way and it is one of the better wooden sheds we have seen in quite some time.